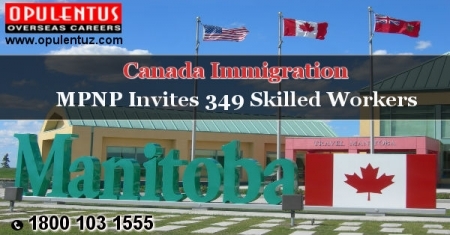 In a draw held on September 26th Manitoba province has invited 349 skilled workers to settle as PRs. Of these 300 candidates were issued in skilled workers category and the score of the lowest-ranked invitee was 602. 49 in skilled workers overseas subcategory were the direct beneficiaries under the Initiative for Strategic Recruitment. These candidates had scored the minimum of 721 points. These candidates can also apply for a provincial nomination with their family members. This nomination makes them eligible to apply to the Federal Government for PR status. This draw brings the total Letters of Advice to Apply to 2,942 in 2017. Through this program, Manitoba welcomes new immigrants who possess the ability to set up themselves and their families in the province, on the strength of the eligibility criteria. There is an 'Expression of Interest' system for skilled workers, where interested persons submit a formal Expression of Interest. After this, they are assigned points depending on their personal factors. The high ranked candidates receive the LAA. After this successful nomination, a candidate can apply to the Federal Government for PR status. Another approach is the visit of exploratory nature where the authorities invite people who have undertaken an Exploratory Visit which is pre-approved and have emerged victorious in the interview held by a program official. The Manitoba PNP for Skilled Workers helps provincial employers to find foreign talent to match and enhance their workforce. The government selects experienced workers who expressed their Interest in immigrating and who possessed the skills required in the local labor market. It nominates them to get a nomination certificate and based on it the person nominated can apply to the Federal Government for PR status. This option is attractive to persons who are not eligible to immigrate through the Federal Express Entry selection system because the eligibility norms are different. Qualified foreign workers, as well as student graduates from various nations, are eligible under this sub-category of the MPNP. Applications are accepted from them if they are presently working in Manitoba, and have been offered a job of permanent by a Manitoba employer in. Qualified skilled workers residing outside Canada are eligible under this sub-category of the MPNP. They must show a strong connection to the province and its labor market. In order to assess the candidate, a points-based system, based on language proficiency, age, language proficiency, work experience, education received and adaptability to Canada is used. Features: Manitoba has a Population of 1.282 million, and its Capital is Winnipeg. It is considered one of the three Prairie Provinces. It is sparsely-populated in the north and has a long coastline of 1,400 km on Hudson Bay. Economy: The main industries are mining, agriculture, and manufacturing. Farming is a major occupation, and the farmlands produce barley, wheat, oats, canola, sunflower, and flax crops. There is an extensive network of dairy farms and livestock farms. Food processing industry has also emerged in some places. It is home to aerospace, manufacturing, and transportation industries also. Winnipeg, the capital, is known for financial and insurance industries, government administration and other services. Climate: Manitoba has a moderately dry climate with sharp temperature variations. Winter is cold and snowy, and the temperatures reach − 40°F. Summers are hot and dry. It is removed from the influences of mountain ranges and large water bodies. It has a flat landscape in many areas and is exposed to several weather systems. Immigrate to Canada and live a nice life here. If you are looking to Migrate to Canada, get in touch with Opulentus, a top company for services in the field of immigration, to apply for a visa.Please contact us at [email protected] or call us 1800 103 1555. Our experts will meet your expectations and provide answers to queries.